Aims: To evaluate and compare the pharmacotherapeutic efficacies of two tricyclic antidepressant (TCA) drugs for masticatory myofascial pain (MFP): nortriptyline (NOR) and amitriptyline (AMI). Methods: Fifty patients with chronic MFP were included in the study; 30 were medicated with AMI only, and 20 took NOR after discontinuing AMI due to adverse effects. Pain diaries recording verbal pain scores (VPS) were utilized to compare posttreatment scores to baseline scores. Chi-square and t tests were used to analyze the data. Results: Across both groups, the mean ± standard deviation VPS score at the end of treatment (2.92 ± 3.2) was significantly lower compared to baseline (6.4 ± 1.75; P < .0001) and was a clinically meaningful (≥ 50%) difference. Initial VPS scores were similar in the AMI and NOR groups (6.27 ± 1.92 and 6.78 ± 1.98). At the end of the study, NOR patients reported a lower final VPS compared to AMI patients (2.83 ± 3.06 vs 4.55 ± 2.92; P = .039). The 50% improvement rate with NOR treatment was better than with AMI treatment (P = .036). The same maximal dosages were used by the patients who achieved a ≥ 50% success rate (20.96 ± 5.036 mg) than those who did not (21.667 ± 5.036 mg). Conclusion: TCAs are effective in reducing pain in patients with chronic MFP. NOR seems more effective and better tolerated than AMI, but due to study limitations, more data are needed to confirm these results. Aims: To investigate whether static jaw clenching can activate endogenous pain modulation and to compare the magnitude between healthy individuals and patients with temporomandibular disorder (TMD) myalgia. Methods: Thirty-three healthy volunteers (17 women and 16 men) and 20 women with TMD myalgia participated. Exercise-induced hypoalgesia (EIH) was examined by recording pressure pain thresholds (PPTs) in the masseter (MA) and brachioradialis (BR) muscles during tooth clenching until exhaustion. Pain and fatigue were assessed before and after clenching, and pain amplification was examined by applying a painful mechanical pressure at the MA for 2 minutes while assessing pain every 30 seconds. Analyses of data included repeated measures analysis of variance. Results: In the contracting MA, PPTs increased over time in all three groups (P < .001), while PPTs in the relaxed BR increased only in the men (P = .045). Pain intensity and fatigue in the MA increased after contraction in all groups (P < .003) and was higher in the women with TMD than in the healthy women (P < .001). Only the women with TMD showed pain amplification (P < .001). Conclusion: Tooth clenching until exhaustion could activate EIH locally; ie, the magnitude of EIH in the MA was similar in women with TMD myalgia and pain-free women, indicating no deficient EIH in women with TMD. However, only women with TMD showed pain amplification during application of continuous painful pressure. Aims: To identify potential predictors of types of treatment indicated for patients with temporomandibular disorders (TMD) and to develop, validate, and calibrate a prediction model for type of treatment. Methods: The derivation cohort at baseline was comprised of 356 adult patients with TMD. Patient and disease characteristics were recorded at baseline as potential predictors. Types of treatment indicated for TMD patients were the end points of the model, classified into no treatment, physical treatment only (including splint and/or physiotherapy), and combined physical and psychological treatment. Multinomial logistic regression analysis was used to develop the prediction model. The internal validation, calibration, discrimination, and external validation of the model were determined. For practical use, the prediction model was converted into score charts and line charts. The score of each included predictor was produced based on the shrunken regression coefficients. Results: Patient age, gender, anxiety, sleep bruxism, pain-related TMD, function-related TMD, stress, passive stretch of maximum mouth opening, and depression were significantly associated with the type of treatment indicated for TMD patients. The multinomial model showed reasonable calibration and good discrimination, with area under the curve values of 0.76 to 0.86. The internal validity of the model was good, with a shrinkage factor of 0.89. The external validity of the model was acceptable. Conclusion: Potential predictors in patient profiles for prediction of type of treatment indicated for TMD patients were identified. The internal validity, calibration, discrimination, and external validity of the model were acceptable. Aims: To test whether the Neck Disability Index (NDI) would indicate higher reported disability among people with neck pain, cervicogenic headache, and temporomandibular disorders (TMD) when compared to people with only neck pain or neck pain with cervicogenic headache. Methods: A total of 62 participants were enrolled and categorized into one of three groups: (1) neck pain only; (2) neck pain and cervicogenic headache; and (3) neck pain, cervicogenic headache, and TMD. NDI scores, pain, cervical active range of motion (AROM), and maximum mouth opening (MMO) were recorded for each subject. NDI scores were compared between groups using the Kruskal-Wallis test, and associations between the NDI and pain, cervical AROM, and MMO were tested using Pearson correlations. Results: No statistical difference in NDI score was identified among the three groups (P = .08). NDI scores were not correlated with MMO (P = .17) or TMD pain (P = .16), but were correlated with cervical AROM (r = -0.635 to -0.311), cervicogenic headache intensity (r = 0.355; P = .004), and cervical pain ratings (r = 0.619; P < .001) across all participants. Conclusion: Participants' perceived disabilities were not associated with TMD pain or MMO. The NDI does not seem adequate for assessing TMD symptoms. Aims: To validate the Arabic version of the Migraine Disability Assessment Scale (MIDAS) and to evaluate the impact of the most frequently studied risk factors for migraine disability on the total MIDAS score in a Lebanese population. Methods: This prospective study was performed from January 2017 to May 2017 and included 44 patients with migraine. Data were obtained using a questionnaire identifying sociodemographic characteristics, medical history, and migraine characteristics. The Arabic MIDAS was used to quantify the disability associated with headaches over a 3-month period. Ten days after completing the MIDAS, the participants were interviewed again to assess testretest reproducibility. The validity of the MIDAS construct in the Lebanese population was confirmed by carrying out factor analyses for all the items of the questionnaire using the principal component analysis technique with a promax rotation. Results: The MIDAS items converged over a solution of one factor that had an eigenvalue > 1, explaining a total of 63.25% of the variance (Cronbach's alpha = 0.812). Photophobia, vomiting, and duration of migraine attack of 24 to 48 hours significantly increased the MIDAS score by 21.396, 22.0, and 17.396 points, respectively, whereas a high socioeconomic level significantly decreased the MIDAS score by 6.837 points. Conclusion: This first linguistically validated Arabic version of the MIDAS was developed to improve migraine management in Arabic-speaking patients. Moreover, the results suggest that having longer migraine duration, more accompanying symptoms, and a low socioeconomic level can increase the MIDAS score and thus the level of disability. Su, Naichuan / Wang, Hang / van Wijk, Arjen J. / Visscher, Corine M. / Lobbezoo, Frank / Shi, Zongdao / van der Heijden, Geert J. M. G.
Aims: To develop models for prognostic prediction of oral health-related quality of life (OHRQoL) for patients with temporomandibular joint osteoarthritis (TMJ OA) at 1- and 6-month follow-ups after arthrocentesis treatment with hyaluronic acid (HA) injections once a week for 4 weeks. Methods: From a cohort of 522 adult patients with TMJ OA treated with arthrocentesis with HA injections, 510 and 463 adult patients were included in the 1- and 6-month follow-ups, respectively. Patient characteristics and history, clinical examinations, and questionnaires were recorded as potential predictors at start of treatment, and all patients underwent an identical treatment protocol. Patients' OHRQoL values at 1 and 6 months after completing the treatment were used as outcome measures. Logistic regression methods were used to develop prediction models, and the performance and validity of these models were evaluated according to state-of-the-art methods, including receiveroperating characteristics curve for the discrimination of the models and calibration plots for the calibration of the models. 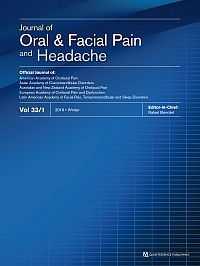 Results: History of mental disease, maximal protrusion of the jaw, muscular pain with palpation, joint pain with palpation, awake bruxism, chewing-side preference, and low OHRQoL at baseline were significantly associated with OHRQoL at the 1-month follow-up, while age, pain in other joints, history of mental disease, joint pain with palpation, sleep bruxism, awake bruxism, chewing-side preference, and low OHRQoL at baseline were significantly associated with OHRQoL at the 6-month follow-up. While the performance of both models was found to be good in terms of calibration, discrimination, and internal validity, the added predictive values of the 1-month and 6-month models for ruling in the risk of low OHRQoL were 19% and 31%, respectively, while those for ruling it out were 28% and 15%, respectively. Conclusion: Several predictors were found to be significantly associated with patients' OHRQoL after treatment. Both prediction models may be reliable and valid for clinicians to predict a patient's risk of low OHRQoL at follow-up, so the models may be useful for clinicians in decisionmaking for patient management and for informing the patient. Aims: To estimate the association between signs of temporomandibular disorders (TMD) and symptoms of posttraumatic stress disorder (PTSD) in a representative sample from the general population of northeastern Germany. Methods: Signs of TMD were assessed with a clinical functional analysis that included palpation of the temporomandibular joints (TMJs) and masticatory muscles. PTSD was assessed with the PTSD module of the Structured Clinical Interview for the Diagnostic and Statistical Manual of Mental Disorders, ed 4. The change-inestimate method for binary logistic regression models was used to determine the final model and control for confounders. Results: After the exclusion of subjects without prior traumatic events, the sample for joint pain consisted of 1,673 participants with a median age of 58.9 years (interquartile range 24.8), and the sample for muscle pain consisted of 1,689 participants with a median age of 59.1 years (interquartile range 24.8). Of these samples, 84 participants had pain on palpation of the TMJ, and 42 participants had pain on palpation of the masticatory muscles. Subjects having clinical PTSD (n = 62) had a 2.56-fold increase in joint pain (odds ratio [OR] = 2.56; 95% confidence interval [CI]: 1.14 to 5.71, P = .022) and a 3.86-fold increase (OR = 3.86; 95% CI: 1.51 to 9.85, P = .005) in muscle pain compared to subjects having no clinical PTSD. Conclusion: These results should encourage general practitioners and dentists to acknowledge the role of PTSD and traumatic events in the diagnosis and therapy of TMD, especially in a period of international migration and military foreign assignments. Aims: To compare the impacts of trigeminal neuralgia (TN) and painful posttraumatic trigeminal neuropathy (PPTTN) on psychologic function and health-related quality of life (HRQoL) using a comprehensive quantitative assessment. Methods: This was a comparative cross-sectional study. A total of 97 patients diagnosed with PPTTN and 40 patients diagnosed with TN who sought treatment at an orofacial pain clinic completed standardized self-report measures of pain intensity, neuropathic symptoms, pain self-efficacy, mood, and indicators of general and oral HRQoL. Differences between the PPTTN and TN groups were tested, and associations of each condition with pain severity, psychologic function, and HRQoL were examined. Results: The majority of PPTTN (66%) and TN patients (80%) were affected by orofacial pain. Pain attacks were more frequent in TN (71%) than PPTTN (28%) patients, while numbness was more common in PPTTN (51%) than TN (12%) patients. Pain intensity was higher in TN for intermittent and affective pain dimensions. Both PPTTN and TN had a significant, but comparable, impact on patients' oral HRQoL. The burden of condition on overall health was significantly more pronounced in patients with TN than PPTTN, with evident differences in the mobility and self-care domains. There was a trend showing that more TN (54%) than PPTTN (36%) patients reported signs of depression, but clinically significant anxiety was comparably high in both groups (34% to 39%). Anxiety and pain self-efficacy were closely related to oral and general health statuses in both groups. Conclusions: Both TN and PPTTN are associated with significant psychosocial burden and reduced HRQoL, indicating a need to develop effective treatments for neuropathic orofacial pain that target functional restoration. Trigeminal autonomic cephalalgias (TACs) are primary headaches that include cluster headache (CH), paroxysmal hemicrania (PH), and short-lasting unilateral neuralgiform headache attacks (SUNHAs) with conjunctival injection and tearing (SUNCT) or cranial autonomic features (SUNA). Hemicrania continua (HC) is another form that has been ascribed to TACs for clinical and pathophysiologic reasons. Cluster headache is the most common of these syndromes, even if comparatively rare, with a lifetime prevalence of around 1 in 1,000. TACs share many aspects from a pathophysiologic standpoint (a hypothalamic activation may be involved in all forms initiating the attacks), but differences in attack duration and frequency and in extent of treatment response distinguish one from the other. This review focuses on the treatments currently available for these headaches according to the most recent guidelines. Due to the low frequency of most TACs, there are little data from randomized controlled trials; therefore, evidence from simple open studies in small case series or single-case observations are reported. Promising results have been recently obtained with novel modes of drug administration, invasive pericranial interventions, and different strategies such as neurostimulation. There are also some future treatments being studied at present. Aims: To investigate the objective and subjective characteristics of sleep and psychosomatic and physiologic variables in young subjects with different frequencies of rhythmic masticatory muscle activity (RMMA) during sleep. Methods: A total of 54 young (mean age 23.8 ± 2.1 years), healthy subjects underwent polysomnographic (PSG) recordings for 2 nights. Sleep and psychosomatic states were assessed prior to PSG using validated questionnaires, and the following PSG variables were assessed before and after sleep: subjective sleep quality, physical symptoms, anxiety level, and salivary biomarkers. Secondnight sleep and oromotor variables were scored according to standard criteria as well as the quantitative autonomic activity during the night. These variables were compared among the high- (H-RMMA, n = 21, mean RMMA index: 5.7 times/ hour) and low- (L-RMMA, n = 13, 2.6 times/hour) frequency RMMA and control (CTL, n = 20 subjects, 1.0 time/hour) groups. Results: Sleep and psychosomatic states did not differ among the three groups. No group differences were noted for nonrhythmic oromotor events. Sleep architecture did not differ among the three groups except for sleep latency being shorter (P = .008) and microarousal index being higher (P = .013) in the H-RMMA group. Mean heart rate during sleep was lower (Stage N2, P = .008; Stage N3, P = .036; Stage R, P = .045) in the H-RMMA group, but the heart rate variability did not differ among the three groups. Sleep quality and anxiety level before and after sleep did not differ among the three groups. Cortisol did not differ among the three groups, while chromogranin A in the morning was slightly lower in the L-RMMA group (median: 9.1 pmol/mg) than in the H-RMMA group (12.3 pmol/mg) (P = .049). Conclusion: In otherwise healthy subjects presenting normal physiologic variables, neither significant nor consistent differences in sleep architecture, psychologic states, heart rate variability, or salivary biomarkers in relation to the frequency of RMMA were found. Aims: To elucidate the role of Link N in regulating inflammatory molecules from human mesenchymal stem cells (hMSCs) under interleukin (IL)-1β stimulation in vitro and under Complete Freund's Adjuvant (CFA)-induced arthritis of the temporomandibular joint (TMJ) in vivo. Methods: In vitro analysis of inflammatory cytokines and epithelial-mesenchymal transition (EMT) genes in hMSCs treated with Link N, IL-1β, and co-stimulation of IL-1β and Link N was undertaken using Luminex multiplex assays and real-time polymerase chain reaction, respectively. To determine the impact of Link N in ameliorating TMJ tissue homeostasis in arthritic conditions, histologic changes in CFA-induced arthritic TMJ tissues followed by application of Link N were examined. All data were analyzed using one-way analysis of variance with Bonferroni post hoc test. Results: Increased levels of IL-6; interferon gamma-inducible protein-10; and regulated upon activation, normal T cell expressed, and secreted (RANTES) were detected in response to IL-1β treatment, but these levels were significantly decreased in the co-stimulation group. In contrast, secreted IL-4, IL-10, and transforming growth factor β1-β3 proteins, as well as intracellular erb-b2 receptor tyrosine kinase 3 and Nodal homolog genes, were increased significantly in the co-stimulation group compared to the IL-1β group. Histologic analysis showed significant recovery for rat condyle thickness in the Link N-treated group when compared to the CFA-induced arthritis group. Conclusion: These findings indicate that Link N could modulate inflammation and EMT in vitro and repair arthritis-mediated TMJ disruption in vivo. Link N could be a potential therapeutic agent for TMJ disorder patients. Aims: To evaluate the risk of hepatotoxicity due to unintentional paracetamol misuse in patients with acute dental pain. Methods: A prospective multicenter observational survey was performed in patients consulting, without appointment, the odontology departments of three main French hospitals in the Lorraine region over a 3-month period. Patients were asked to fill out a medical questionnaire while seated in the waiting room. Those who completed the questionnaire, had dental pain, and took paracetamol were included in the DAntaLor study. Misuse was defined as a daily dose of more than 4 g of paracetamol per day. The risk of hepatotoxicity was considered high if the supposed ingested dose was above the threshold of 150 mg.kg-1.24h-1, 125 mg.kg-1.24h-1, or 100 mg.kg-1.24h-1 over periods of 24, 48, and 72 hours, respectively. Hepatotoxicity was suspected in the presence of clinical symptoms. Results: Of the 1,810 patients consulting the odontology departments, 741 were included in the study. Painkillers were used in 74.4% of the cases, and paracetamol was taken by 81.7%. Paracetamol was self-medicated in 85.5% of the patients and misused by 6.0%. Clinical symptoms were observed in 1.6% of the patients with no paracetamol misuse. For patients consuming more than 4 g per day and experiencing mild unspecific clinical symptoms of hepatotoxicity, the suspected ingested dose category was below one of the three previously defined thresholds for 11.8% and was above for 40.0%. Conclusion: Patients with dental pain are at risk of paracetamol overdose and hepatotoxicity. Khawaja, Shehryar N. / Scrivani, Steven J.
Trigeminal autonomic cephalalgias (TAC) are primary headache disorders that are characterized by severe unilateral pain along the distribution of the trigeminal nerve with corresponding activation of the autonomic nervous system. The clinical characteristics and presentation of TAC are unique; however, there may be an overlap of these features with other painful conditions affecting the orofacial region, which can be a diagnostic challenge for the clinician. This article reports a case history and discusses the differences between clinical characteristics of TAC and other painful orofacial conditions. Refractory pain conditions and the occurrence of episodic pain attacks with accompanying autonomic symptoms necessitate a thorough evaluation to rule out rare causes of head and face pain. Aims: To investigate how photographic images (Pain Cards) co-created by an artist and chronic pain patients could be used in groups of patients with burning mouth syndrome to facilitate characterization of their pain and its impact on quality of life. Methods: Ten groups of patients with burning mouth syndrome attending a 2.5-hour information session in a facial pain unit were presented with 54 Pain Cards put in a random order on a table. They were asked to pick one card that described the quality of their pain and one that reflected the impact of the pain on their lives. The total number of patients was 119 (divided into groups of 8 to 14) over a 4-year period. Results: A total of 114 patients chose a Pain Card; 24 cards (chosen a total of 73 times) were used to phenotype the pain and 39 cards (chosen a total of 127 times) were used to describe the impact of the pain. The most frequently used Pain Card (13 times) was a pair of lips closed with a clothes peg, whereas the other most frequently selected images were black and white. The choice of Pain Card and words used to explain the choice implied a neuropathic type of pain. Themes that were common included those of isolation, loss of confidence, low mood, and decrease in activities and socialization. Conclusion: The Pain Cards chosen and the main themes support those found in the literature on BMS. The Pain Cards may help pain sufferers gain more empathy and support due to improved understanding by their health care providers.